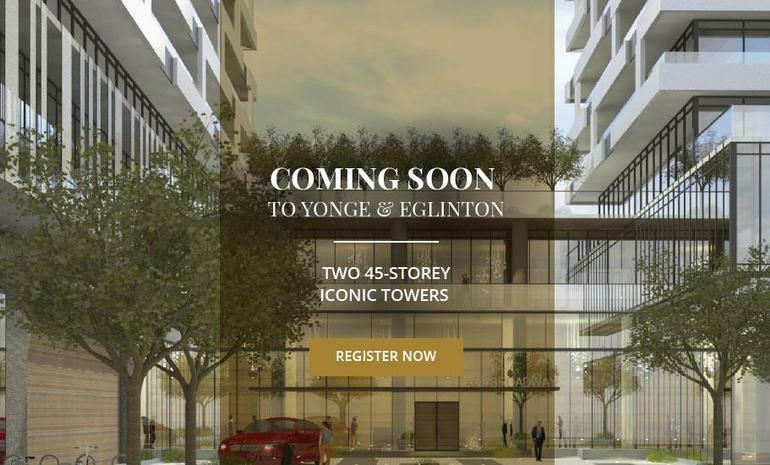 This is a new condominium development soon to come to Toronto at Yonge and Davisville. This will be a mixed use development with retail and commercial space on the lower levels and retail suites just above. The proposed heights for this building are 25 and 34 stories. Approximately 450 residential units have been proposed for this project. The project features a 2 acre location stretching a full city block. The four level underground parking garage will accommodate approximately 268 vehicles. You can choose from suites and condos. Besides studios, there are 1 bedroom, 2 bedroom, and 3 bedroom units. The payment plan is attractive. It is currently an under construction project. The location of this project offers several advantages to residents. This location has a high walk score, which means that most errands and amenities are located nearby, and can be easily accessed by foot. Public transit is also easily accessible from here. There are multiple bus routes and subway station in the vicinity. A new city park will be built right next to the development. The future LRT is just a short walk away. A leading player in land acquisition, planning, design, development, and construction of premium-quality commercial and residential properties, Times Group Corporation is inspired by core family values of quality, trust, and tradition. It focuses on exceptional quality, sustainability, and enduring value. Besides, it is actively engaged in the development of high-rise condominium projects, distinctive homes and condominium townhouses in the GTA. Every project by this Group is distinguished by an integrated planning process, a meticulous attention to detail and a commitment to enduring value. This Group is also the winner many prestigious industry awards, including the 2013 BILD Award for Green Builder of the Year- Highrise in recognition of its green building philosophy.